Seems like the consensus is that we are going to see a Turnpike Superbowl. I don't think so. 1. In the latest AP Poll, Pitt is ranked 24. Pitt was a preseason #25 but lost to Bowling Green (ugh) in game one. The remaining schedule is tough - at Navy, Rutgers, at N.D., Louisville, at Cincinnati, WVU, and at UConn. Albeit none of them are ranked but they are viable opponents. I see a 4-3 run for an 8-4 season which is an improvement and will keep Wannstedt employed. 3. Phillies over the Dodgers in six. Boston over T.B. in five. 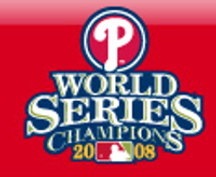 Phillies need to get those bats working again but I think they are the better team and will step it up notch to combat the hot Dodgers. Rays' dream season will end facing the team of the decade. 4. I predicted this in August but don't think I blogged it: Eagles 9-7 this year. Oops! 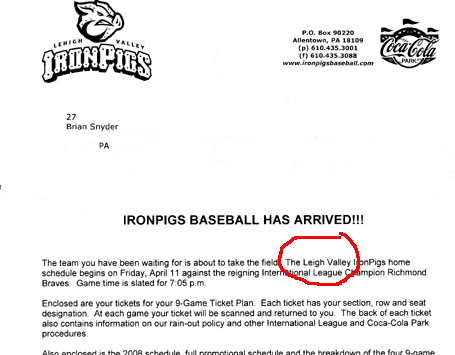 I meant to buy tickets for the Lehigh Valley IronPigs, not the Leigh Valley IronPigs! 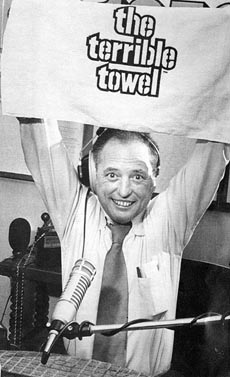 Fellow Pittsburgh alumnus Myron Cope has passed away. A local legend, Cope was an integral part of Pittsburghcana. Outsiders may have found him hard to bear but, just as I did as an outsider, I learned to appreciate the man and understand how much he meant to Pittsburghers. He was truly one of a kind and his golden voice and witty perspectives will sorely be missed. yoi!